Communiqué de presse - 246 official delegates this year from 35 countries! 246 official delegates this year from 35 countries! QATAR – 2 November 2016: Milipol Qatar 2016, the leading event dedicated to homeland security in the Middle East, has concluded a successful 11th edition. 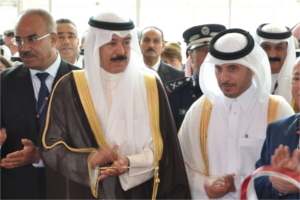 Held under the patronage of His Highness Sheikh Tamim Bin Hamad Al-Thani, the Emir of the State of Qatar, who honored Milipol Qatar with his visit this morning and opened by HE the Prime Minister and Interior Minister Sheikh Abdullah bin Nasser bin Khalifa Al-Thani. The event is organized by the Ministry of Interior of the State of Qatar in partnership with the French-based Comexposium Security. The Ministry of Interior alone generated 11 contracts during Milipol Qatar 2016, held at the Doha Exhibition and Convention Center, of QR 260.05 million. The 11th edition, which also marks 20 years since the leading bi-annual event was first held in Doha, attracted 6538 visitors from 103 countries which is comparable with the last edition. 35 countries were officially represented by 246 official delegates this year, an increase of +68 per cent compared to the last edition. Furthermore, the event’s 230 exhibitors, representing 35 countries, included eight new country entrants since 2014 with the addition of Algeria, Belize, Cyprus, Jordan, Lithuania, Luxembourg, Pakistan and Uganda. The Qatar contingent represented a large section of the exhibition floor with 54 companies exhibiting, and a further 27 from France, 23 of which were located within the French pavilion. Other international pavilions which were also present at the event were China, Germany, North America and the UK. “This year’s event is again a very successful Milipol Qatar edition. Exhibitors and visitors alike have expressed positive feedback following the 11th occurrence and affirms its position as the most influential trade exhibition dedicated to homeland security in the region,” Muriel Kafantaris, Exhibition Director – Milipol Qatar 2016, said. A key feature at Milipol Qatar 2016 was the introduction of a dedicated zone for Civil Defence, which saw a number of global and regional exhibitors showcasing products and developments within the sector. The prime position zone was complemented by the Ministry of Interior of the State of Qatar’s stand, which also allocating a portion of its own stand to civil defence. When Milipol Qatar returns in 2018, the show floor will incorporate the existing Civil Defence Exhibition & Conference. The two events merging in order to become the region’s homeland security and civil defence sectors leading event. The second and final day of the Seminar focused on “Critical Infrastructure Protection – Cyber Threat Intelligence”. “Registration for the inaugural Seminar program exceeded our expectations, with a great number of visitors and exhibitors attending various sessions throughout the two days. The positive feedback will continue to drive our ambition to explore further talking and debate opportunities in 2018, again creating an attractive agenda of leading industry personalities,” Kafantaris added. The show’s Main Official Sponsor was Adbullah Abdulghani & Bros. Co., while the event’s Diamond Sponsors were Qatar Petroleum, Saleh Al Hamad Al Mana Co., and Qatar Diar. The Platinum Sponsor was Qatar Tourism Authority, Silver Sponsors included Watar Rail, Ineo Homeland Security, and Naffco, and the Bronze Sponsor was Nexter. In addition, the event’s Official Carrier was Qatar Airways, its Official Forwarder was Milaha, and its Official Hotel was Sheraton Grand Doha Hotel. Other Official Sponsors included Ooredoo, Hemaya Security and Alhazm. The 12th edition of Milipol Qatar will be held in October 2018. Further information about this year’s edition and future events can be found through the official website, www.milipolqatar.com. Milipol Qatar, a trade exhibition dedicated to homeland security, has been co-organized by the Ministry of Interior of the State of Qatar and the French-based Comexposium Security since 1996. Every two years, Milipol Qatar attracts and welcomes to Doha the biggest companies in the public and industrial security sector in the world. These companies showcase the latest products and service innovations in the fields of security, safety, detection and prevention equipment and systems as well as various other defence supplies. For over 30 years, the MILIPOL brand has been synonymous with high quality, international exhibitions covering the field of homeland security. It has been proudly represented by Milipol Paris and Milipol Qatar. After the 2015 edition of the Global Security Asia exhibition and conference, the event will be renamed Milipol Asia-Pacific. This effectively creates the world's leading international network of exhibitions dedicated to solutions, technologies and innovations for homeland security.